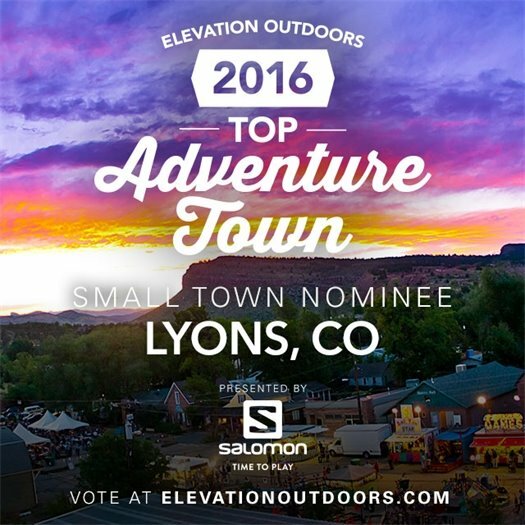 Lyons is a finalist in Elevation Outdoors Magazine’s Top Adventure Town poll! The contest runs from Aug 8 to Sept 19, and consists of 5 head-to-head rounds among other towns in the same division, with winners of each round advancing. The three winners will be featured in the November print issue of Elevation Outdoors Magazine, and offered a substantial discount to advertise in the November or December issues. Each person can vote once per day. Show your support in showcasing Lyons as the Top Small Adventure Town! Items left in parks and Town property that have been turned in or collected by staff can be identified and claimed by owners at Town Hall. 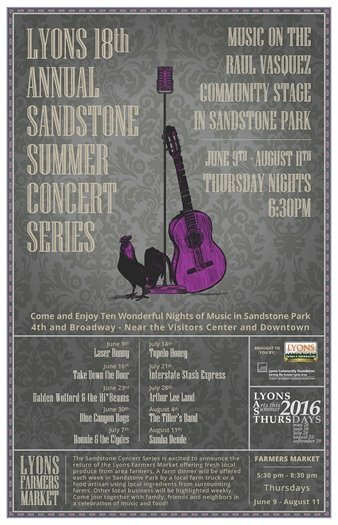 The rained-out August 11 Sandstone Summer Concert, featuring Samba Dende, has been rescheduled for Thursday, August 18, beginning at 6:30 p.m.
Don't miss this final final concert! Curb and gutter installation on Prospect St., Evans St., Park St., and 4th Ave. is anticipated to begin the week of August 22. As planning develops, project teams with be working with residents regarding alternate parking, and additional information will be sent via eblast. Continuing next week, the Town of Lyons, along with the hired consultant team, will move forward with its final series of public meetings for the Lyons Primary Planning Area (LPPA) Master Plan. As part of this planning process, the LPPA has been broken out into three small areas: the Eastern Corridor & Gateway (Phase I - completed); South St. Vrain Area (Phase II - completed); and Apple Valley (Phase III). Phase III will include 3 public workshops focused on the Apple Valley Planning Area. The LPPA includes parcels that are currently outside of Town limits, but within an area which has been designated as appropriate for future annexation and development according to the Boulder County – Town of Lyons 2012 Intergovernmental Agreement. The workshop on July 18 will be the first workshop in this series. Formal Meeting: 5:30 to 7:30 p.m.
Can't make the workshop? A public forum is available on the LPPA page on the Town's website, to collect feedback and ideas for the Lyons Primary Planning Area Master Plan. Additionally, FAQs and the latest presentation materials from past workshops can be found on the website. Since 2013, the Town has discontinued curbside chipping. Please remember that it is illegal to place branches and unwanted limbs on Town & CDOT right-of-way property, which includes parks, alleyways and any property in the buyout program. For your convenience, the following links to Western Disposal's branch and yard waste services: www.westerndisposal.com/drop-center/wood-waste/. Thank you for your understanding and cooperation in this matter. On Thursday, Aug. 11, 2016, Sheriff Joe Pelle amended the fire ban currently in effect. Due to the lower temperatures and recent moisture the fire ban has been amended to allow certain activities to take place that were previously prohibited. The Saint Vrain Creek Coalition is seeking ideas from our stakeholders for flood recovery projects in the watershed that are currently unfunded in order to create a "wish list" of projects that could be addressed if/when funding opportunities arise. Please do not reply to this email, as we are unable to respond to inquiries sent to this address. Please direct questions to Arielle Hodgson. Copyright - 2015 Town of Lyons, Colorado. All Rights Reserved.